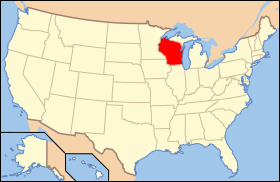 'S e tè de na Stàitean Aonaichte a tha ann an Wisconsin . Tha i suidhichte san àirde a tuath na dùthcha. Tha 5,686,986 duine a' fuireach anns an stàite. Tha e air a bhith na stàit bho 29 an Cèitean 1848. Tha Madison na prìomh-bhaile ach 's e Milwaukee am baile as motha a tha ann an Wisconsin. Air a tharraing à "https://gd.wikipedia.org/w/index.php?title=Wisconsin&oldid=520254"
Chaidh an duilleag seo a dheasachadh 31 dhen Iuchar 2016 aig 06:29 turas mu dheireadh.